Many councils and other organisations were founding supporters of the Alliance for Gambling Reform, launched in October 2015. 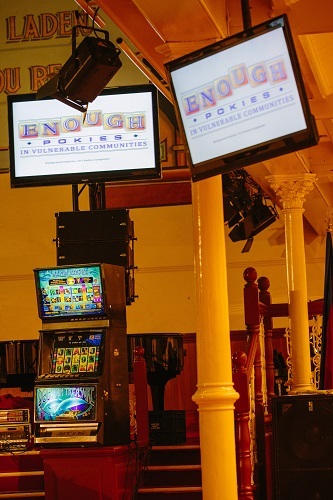 The Alliance campaigns for reforms to the gambling industry to reduce harm from poker machines and to protect disadvantaged communities from the infiltration of increasing numbers of poker machines. The councils and organisations that form the Alliance have a shared concern about the deeply harmful and unfair impacts of gambling and its normalisation in Australian culture. Australians spend more money on gambling per person than any other country in the world, and pokies are the leading cause of these losses. In 2017-18 Victorians lost $2.69 billion on electronic poker machines, which is equivalent to $550 per adult. That's $7,383,561 lost every day! The Victorian Commission for Gambling and Liquor Regulation has data on gambling losses by municipality. Research in 2016 found a statistically significant correlation between poker machine density and police-recorded domestic violence rates among postcodes in Victoria. Gambling, and the many harms associated with it, has been identified as a priority concern for local government. The Gambling Regulation Act 2003 provides councils with the right to raise concerns with the Victorian Commission for Gambling and Liquor Regulation about the social and economic impacts of pokies in their area. However, experience has shown that these costly and time-consuming submissions are given little weight by decision-makers. This is why the Alliance for Gambling Reform is so vital for councils, organisations and the community itself. A united voice to speak out against pokies is absolutely vital to ensure their impact is lessened. More than 25 Victorian councils are supporters of the Alliance, along with many other organisations concerned about the harmful impacts of gambling and its normalisation in Australian culture. The Alliance for Gambling Reform website has a number of suggestions for how Victorians can take action against gambling. These include writing to the Minister of Gaming and signing petitions targeted at the Victorian Government. The Alliance has state election 2018 policy summary. Sign the petition calling for reforms to reduce pokies harm in Victoria. Ban political gifts and donations by poker machine owners, operators and peak bodies.